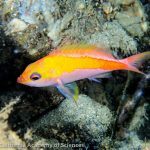 Deep-water Anthias collected in Long Island bay…in 3ft of water! 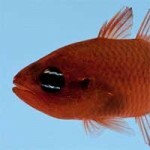 Home / Eye Candy / Deep-water Anthias collected in Long Island bay…in 3ft of water! This time of year, when I get a call from my friend, Bob Janke, it usually means he’s on his way home from a snorkeling trip in Shinnecock or Moriches bay and he’s giving me a tropical fish report. When I find multiple missed calls and text messages, it usually means he either caught something that he can’t identify or he caught something really cool, like a French angelfish. Two years ago he brought me a creole fish (Paranthias furcifer), that turned out to be a new species for New York State and a range record for the species. When I called Bob back yesterday, he described a small fish that he caught hiding among the cracks of a rotting piling in 3 feet of water in Shinnecock bay as “very similar in shape and behavior to the creole fish, but pink rather than maroon.” I immediately thought of the Anthiinae, the subfamily of Serranids that includes Anthias and related genera, but I tried not to get too excited­­. As far as I know, there are no shallow-water members of this group in the Atlantic. Five minutes later, Bob pulled his car up to the loading dock of the Aquarium and got out, still dripping wet, holding a clear plastic jar filled with water. 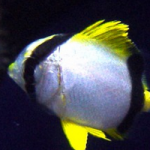 I noticed a short bigeye (Pristigenys altus) and some assorted butterflyfish swimming around. Covering the bottom of the jar was a layer of loose tunicates, blue mussels, and other invertebrates as well as some seaweed. I moved the contents around with my hand, bracing myself for disappointment, when suddenly a tiny Anthias popped out from under one of the mussels. I let out an audible gasp. Bob and my fellow aquarists moved in for a closer look. “This is huge” I said. When I asked Bob if he would mind if I took it inside for some photos, he told me he was donating it to us. At that point I had to try hard to contain my excitement, but I wasn’t doing a very good job. After a lot of animated speculation, I got photos out to my most trusted deep-water basslet experts: Carol Baldwin of the Smithsonian Institute and Forrest Young of Dynasty Marine. 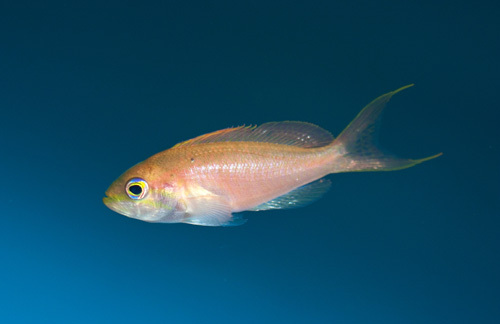 We all agreed that it has to be one of two species: Hemanthias vivanus (red barbier) or Choranthius tenuis (threadnose bass), both of which are usually found at depths of 200-2000ft (60-600m) . 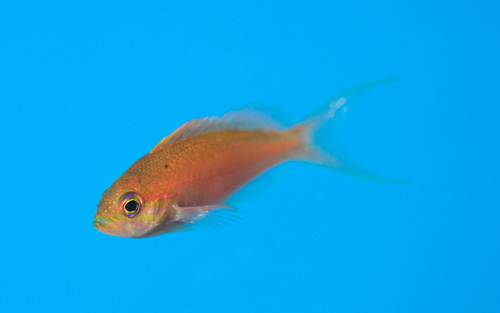 The fish is settling in to its new home at the Long Island Aquarium and has begun eating copepods and mysids. As soon as he seems ready to handle the stress, I’m going to get a fin clip for Carol Baldwin for DNA sequencing and a definitive ID. Of course we’ll know soon enough providing he keeps eating and growing, since the adult forms are easily distinguished. Regardless of which species it turns out to be, this capture will probably turn out to be a record for both range and depth. 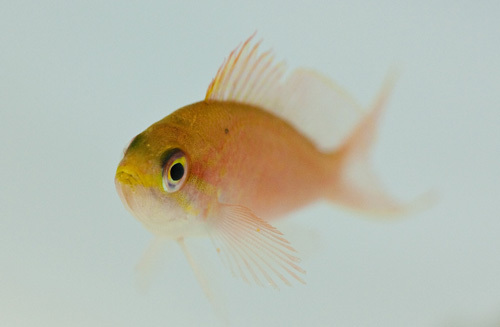 Not surprisingly Atlantic Anthiines are poorly studied and rarely displayed in aquaria. 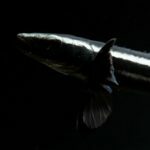 This specimen should provide us with some unique opportunities to learn more about these beautiful, deep-water fishes. Now, I’m off to spend the day snorkeling around pilings in Shinnecock bay. There must be more out there. Awesome Todd! The fish couldn’t be in better hands. Thanks Dom. Come by and see it sometime.